Small - £28.99 Medium - £28.99 Large - £32.99 Only 7 left! Well, well, well. Look what washed up on the shore. It's a Jellyfish! And this time, it's not just any old creature of the sea that found itself on the sandy coast. 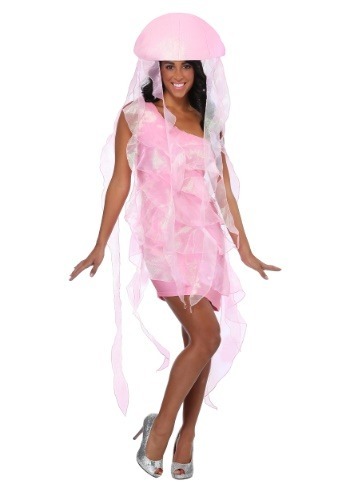 This time it's you, because you chose this women's Jellyfish costume. What an awesome decision! Now you can become one of the weird gelatinous animals of the ocean when you go in this costume. It's made and designed by us right here at HalloweenCostumes.com, and as an exclusive, we can let you know that this is the only place you're going to find this unique costume for sale! Do you think you have what it takes to become one of these free swimming creatures? This whimsical costume for women captures the funky look of the Medusozoa species (as they are known officially). The bell is an over-sized headpiece for your head, and the costume is a sleek dress. Of course, mesh "tentacles" are attached to both costume pieces, so when you float about the party, you can look like you're swimming the sea. Just don't go about trying to sting anybody, that would definitely be frowned upon! This fun costume will be an awesome choice for an ocean theme group or ensemble. Whether you imagine yourself under the sea or being washed up on shore, we're sure you're going to be very alluring. Team up with your beau or bestie in a shark costume, and you'll be ready for all the oceanic fun!